The worst Yuengling I've ever had. My rate is an outlier so I need to write this review. When they first re-released this beer in draft only format a few years ago, I bought a half barrel just for something familiar to offer my guests who didnt dig other more flavorful options. The following year, it came out in bottles. This review is based off several pints on draft. This beer is classic yuengling but slightly darker. Void of most typical bock maltiness and in its place is a mineral and carbonic water profile with slight buttery diacetyl. From what I understand, this beer has been discontinued...again. Good riddance. The color is a good auburn shade with translucent clarity and thin tan head with fine bead and good retention. The smell is malty with light woody phenolic and earthy odor with almost meaty scent and light roasted aroma with hint of spice of yeast. The feel is the best part with good body and medium sweetness with light dry and medium carbonation level with gentle bitterness in the back with toasted texture and mostly dry finish wiht slight alcohol but mild overall on the palate. The taste is decent with some light dry malt with toasted flavor in the grain with mild spice aspect and mild caramel element with low sweetness in general yet good lagerr character but a sort of bland quality with mild earthy note and recurring stale spice accent with dry yeast taste in the finish without much snap. This is not the best or worst in my view -good yet nothing making it stand out, fair to midland and I won't return to it...especially because it is no longer being produced-not a surprise. Second bottle from the six-pack (plus one) that I got in the mail from @tommyguz last week. I don't see a bottling date anywhere, but I assume this is from earlier this year before the announcement that Yuengling won't be making their bock anymore. Color is a dark brown, and semi-translucent -- I can't read my phone's screen through it, but I can see the light from it without any difficulty. There's some bubbles rising up from the bottom, and a decent-sized head of off-white foam on top that shrinks into a light coating after a bit, leaving a thicker ring around the edges. 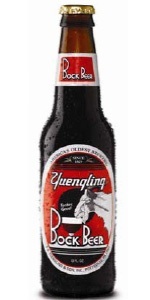 Basically looks like a darker, slightly less clear version of the regular Yuengling Lager. Nice little beer-drinking goat on the bottle. Smell is... actually not bad! The first bottle I had, I was getting more of the "weird hair salon smell" I always pick up on in the lager, but the one I have in front of me right now is lacking most of that and coming across as more of a dark, almost-caramel-ish bread/malt sort of smell more than anything else. Sweetness and something almost roasty. Not a strong smell or a really impressive one, but it's fairly pleasant. Taste goes along with the smell, though the taste is better. It's bready, but with more of the "darker" flavors compared to the standard Yuengling lager. It really does come across as a darker, stronger, and tastier version of the regular Yuengling lager more than anything else, though there is one interesting twist I'm picking up on -- hops. Specifically, just a bit of a leafy flavor and a little bitterness near the end, which I haven't noticed in any of the other Yuengling beers I've had. And it's working together quite nicely with the chicken fajitas I was cooking while drinking the first half of the glass, too. Overall, I think I'll agree with the goat having a sip from that fancy glass on the bottle: "Tastes Good." Feel is pretty nice for the most part, too. Easy to drink as quickly or as slowly as you feel like at the time. I am noticing that it seems a little less smooth going down alongside food compared to when I was just having the beer by itself, but that's a pretty minor complaint, it's not a drastic difference or anything. Overall, this is a pretty nice beer, especially when considering just how affordable anything from Yuengling is. I'd buy this over the Black & Tan every time (and probably even over the regular Lager at least half the time) if it was available around here, so it's a little sad to know that they're discontinuing it after this year and the five remaining bottles in my fridge are probably the last ones I'll ever have. I'm glad I got a chance to try this one while it's still available, though, and I suppose there's always a chance they'll bring it back in the future -- they've discontinued their bock and then brought it back decades later at least once already, after all!